Brian Wilson, co-founder of The Beach Boys, is one of popular music’s most deeply revered figures and the main creative force behind some of the most cherished recordings in rock history. Rodriguez is a self-taught guitarist and legendary singer-songwriter known only by his surname. 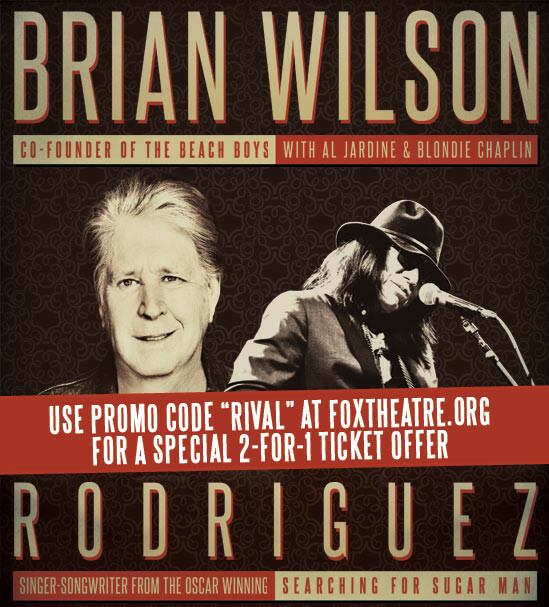 Both artists are the subjects in two different cinematic features – Brian Wilson in the recently released biopic Love & Mercy, and Rodriguez as the subject of the 2012 Oscar-winning documentary, Searching For The Sugar Man. These two interesting and talented men will be performing live for a special night at the fabulous Fox Theatre in Atlanta, GA on Friday, June 26 at 8pm. Wilson’s remarkable journey began in a Hawthorne, California, home that was filled with music. His parents both played piano, and Brian’s vocal gift was immediately evident when he would sing harmonies with his two younger brothers. He was barely out of his teens when he began to create some of the most beloved records of all time – nine consecutive “gold” albums that featured such classics as “Surfer Girl,” “In My Room,” “I Get Around,” “Don’t Worry Baby,” “Fun, Fun, Fun,” “California Girls,” and many more top 40 hits that Brian co-wrote, arranged, produced and performed on with his family band, The Beach Boys. Tickets are $46.50 – $96.50. Use promo code RIVAL for 2 for 1 tickets!